New Facebook chat window shows the both online and offline friends in single window and you have to scroll down to see all online friends or search for the specific friend from the search area. If you are irritated with this chat box and wants to remove it to show only online friends then install Facebook Chat Fix Google chrome extension in chrome browser. Along with removing all offline friends from the list, It will also remove the Live News Ticker box from your Facebook. This works only on Google chrome. It is a simple extension which will revert your new Facebook chat box back to old chat box. It is Google chrome extension so you don’t have to like any page and install any application before using this extension and you don’t have to grant permissions from your data to install this extension. The Above method will only work in windows operating system. In Mac and Linux you have to Drag and drop this link “Fix Chat” to your bookmark bar. Note:This is a browser trick so changes will be visible only in your browser. There's a good news for those Facebook's users who always using Paypal account, it's because now Paypal app is available on Facebook that allows you to sending money to your friends via Facebook. 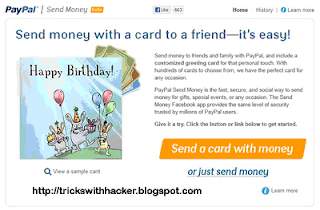 The Paypal Facebook app named Send Money, letting you to send money to a friends, and family with paypal, not only that but you also can customize the card greetings for your friends and family easily. "Facebook users can now send money to their friends and family whether it’s for a special occasion like a birthday or anniversary or just because along with an e-card, photos, videos and a message. With just a few clicks and a PayPal account, it’s so easy!" So, why an app on Facebook? PayPal is going to where friends and family connect now. According to Facebook, about 50 percent of its 750 million users log onto the social media network daily and average about 130 friends. And, the Greeting Card Association estimates that Americans send 500 million e-cards annually. If you're curious and wondering about this Facebook App, you can go to visit the app. As we all known, that a few moments ago Facebook added a few features so-called Live Ticker sidebar. Which is the "live ticker" notify any user who shares, likes, comments to others, you even can give respose such as give comments on it. This "Live Ticker" for some people is very disturbing and wanted to delete or disable it. Well, for you who want to know how to remove/disable Facebook "live ticker", then you are on the right posts at this time. All we need to do just adding a plugin to the browser in which this can be done for anyone who uses Chrome and Firefox browser. 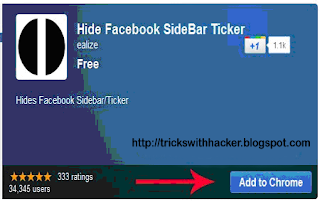 If you are used to be using Chrome browser, then you just simply install an Extensions called Hide Facebook SideBar Ticker. Step 2. 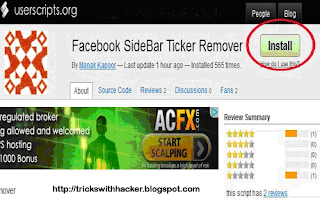 After you have installed Grease monkey, now just simply install another firefox plugin called Facebook SideBar Ticker Remover, then restart your Firefox browser. Note: This only works in India. Have you ever imagined to use your mobile phone enable to access Facebook when you haven't any browser on your mobile phone? or You might be you wanted to access Facebook, but there's no apps supports on your mobile phone when you are using an old phone (like Nokia 1100)? Anyway you don't have to worry when you can't find the internet browser on your mobile phone to access Facebook, it's because as long as you own any mobile phone, you can now enable to access your Facebook account. This services given by Facebook India which partnered with Fonetwish, while to use this service for unlimited usage, it only priced around 1.00 Indian Rupee per day, enjoy! As You know that now Facebook has activated the subscribe button, which the subscribe button allowing anyone or Public to know what's going on with You, or everything You posted on Your wall, like status updates, photo upload, notes, etc. Once You activated this feature, someone out there, even someone You don't even know who has clicked the button to subsrcibe You, so that that person would known or kind of following You, everything You updated. In other word, Facebook Subscribe button is similar like "Follower" in Twitter. By activating the subscribe button, it means You're allowing Your account easily to accessibility from public, they'll receive notifications from You even though they're not on Your friends list. If You are kind of person who likes to keep private, then I'm sure some of You won't this happened right? Or You might be think, there's someone who stalking You wherever You go without You knowing them. Go to Your Profile page then You find the Subscribers and then click on it. Now You click on Settings on top right corner to edit. Now, You have turned off, and disabled the feature named Facebook Subscribe Button, which there's no one will able to subscribe You. Enjoy..!! These days Facebook still the most popular social network used by hundreds of millions of people in this world. As it is used by millions of people, so many companies / individuals who advertise their products on Facebook and you see the ads that appear on the right sidebar of your Facebook page profile. However maybe some of you hate the appearance the ads on Facebook, so you think to disable all ads? If you really want to disable, block, remove the advertisements of Facebook, Youtube, even all the web pages. 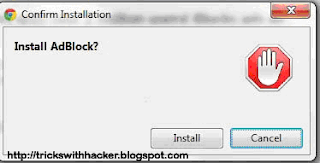 Then with using the most popular with over 2 million users Chrome extension named AdBlock you can now to block all over the web advertisements on all web pages, even Facebook and Youtube. All you need to do just click "Add to Chrome" and click install, then you wait a few seconds the installing process, and Bingo..!! you'll see the ads disappears from your facebook, Youtube, and all the wep pages. Now you'll see your Facebook page clean from any ads, sponsor, advertisements. I'm sure many of Facebook users haven't known yet some of tricks they should know about to use Facebook, especially when they're chatting with friends. As You know that many of Facebook users spending much times chatting on Facebook, they're sending text each other on chat box. Then may be some of you want to send a photo profile instead of message text on Facebook chat box to Your friends. Yes, You enable to send the photo too via inbox message, but this time You'll know how to sending profile photo of any Facebook users including your friends on Facebook chat box. Note: If you want to add more photos just simply repeat the same thing, or you can also add multiple users IDs for many photos of users at the same time before you hit ENTER to send it to your friend. I hope this make You fun, enjoy..!! Do you have a memorial photos album in your Facebook account that you would like to delete, but they're worthy for you and you won't to lose them? Anyway, before you delete your photos album, I think it's time for you to download and backup your photos album and the whole pofile. Well, if you want to backup whole of your Facebook profile including the photos album, then you can now. 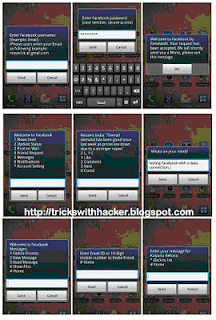 There's trick to do that in a very simple way with using the Facebook2zip. 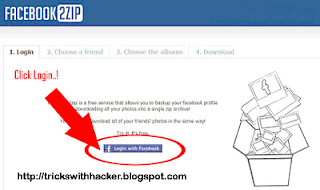 Just to let you know that Facebook2zip is a free service that lets you to backup your facebook profile and downloading all your photos into a single zip archive. Not only that but You can also download all of your friends' photos in the same way, and this services is for free. Click Login button to connect between Facebook2zip and your Facebook account, and then click allow permission. Now is Choosing your friends, Select your name if you want to download your photos or type the name of a friend to download his photos. Then click on next button. Then you click download to grap all the photos album. Then click on the button below to get the file. 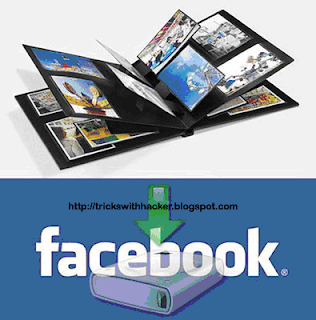 Once you've done, all your Facebook profile inlcuding the photos album will dowloaded to the file zip saved to your computer hard disk. Enjoy..!! Facebook Timeline enables people to search and access older content very easily. As in the old facebook profile it was hectic task to find out what has been posted about few months or a year ago but in Facebook timeline all your activities are arranged in chronological order and it allows your friends you check out all your Facebook content. So if you think you have posted something abusive then it is time to delete that content. Exfoliate is an application for Android phones which can sweep content from Facebook which you have posted about one/two year ago. You can choose the content like status updates, photos, likes and many more that you want to remove from your timeline. You also remove all the posts that you had posted on your friends wall in past. If you are active user on facebook then it may take long time to clean all your activities. First of all you have to Remove Facebook Timeline your account. 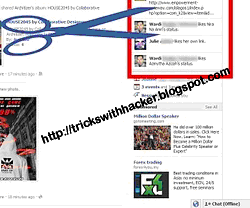 Click to check how to remove facebook timeline. Click on the favourite created in second step. Now window will pop-up asking you from where you want to remove your posts. Select the number from the drop down list and click on GO button. That’s it! Be careful while deleting your old facebook content because once deleted it cannot be recovered back. After the launch of Facebook Timeline, some special applications were introduced .These applications are specifically designed to promote “Frictionless Sharing” i.e it will automatically post updates once you grant them permissions. These applications are categorized under several groups like Entertainment, Food, Music, New etc.If you add a music app like iHeartRadio then it will automatically post an update about the song you are listening, so privacy is a major concern in these apps. After adding application in Timeline, you will continuously receive updates from that app. Privacy Settings for all these apps should be carefully customized. Select desired application and click on Go To App button. Now that particular Application will be added in your Timeline. During Installation of App, in Go To App window click on the Public button. Select the appropriate group to which you want to show the updates. Note: You can also choose Custom to Hide your activities from specific people. If you're bored with the appearance common of Facebook, I think you have to try your Facebook account translated into un-common languages. Yes, I'm sure these 2 languages provided by Facebook itself will make you laugh, whih it'll make your Facebook account looks weird but full of fun, they are English (pirate) and English (Upside Down). Once you've done, Go to your Page and see the magic..Enjoy..!! If you take a look even deeper at the "message" section on the Homepage of your Facebook account, I'm sure you probably will get a little surprised when you "double click" of your mouse on the "message" section, which you will discover that your have 2 inboxes there. Yes, the first one called the "primary" inbox, and the second is the 'others' inboxes. Back a few months ago when there was only one inbox there, I found all my inbox filled full with messages that come from groups that I have joined, or some companies were advertising to offering it to me about their products. It turns out there I also wonder, where are all the ads that usually come through my inbox and I kind of found it looks like they're "Gone", then I asked myself, "Did Facebook has removed them? ", while I didn't do anything with them, I meant I didn't delete them at all from the list, until I "double clicked" the message section in the "home" of my Facebook account, in fact they are all hiding in the the second inboxes so-called "other". Honestly, at the first time I clicked, I was quite surprised because there are over +50 messages that I had not read before. It looks like Facebook does not send you a "notifications" on all incoming messages that come to you on the second inbox called "other", until you "double click" on the message section to view it. Then, it's because there's no notifications that send out to you, so I'm sure there are so many Facebook users out there who do not know the existence of the second inbox. Meanwhile, personally I am a little bit happy that Facebook not sending me a "notifications", it's because after I had seen the majority of the incoming messages has came from a "groups" or "advertisers", but there's also I found a little messages that has coming from my friends too. Well anyway, now I know that there are two inboxes there exist now. What about you? What To Do When You're Uncomfortable, or Bored on Facebook? You've been on Facebook for a years, then You found Yourself seems uncomfortable anymore about to use it. Anyway, if You look at the title above, "What to do when You have uncomfortable with Facebook?, then there's could be a various answers behind that. You, Yourself have the specific reason why You're think and feel that way, Facebook is no longer comfort and save for You. The reason could be the privacy that You think it's such annoying You, or it could be You may think that Facebook is a place to waste your time and procrastination, etc. Everytime You post status updates, Facebook asks You "What's in Your Mind? ", it seems that Facebook knows everything about You more than yourself. Facebook knows what's in Your mind, Facebook knows Your feeling, Facebook knows with whome You're in relationship with, Facebook knows everything about You. However, those all the consequences of social network, Your privacy it's like a stake. Because You use it for free. If You have the feelings that You're no longer comfort, or bored on Facebook, I think best for You to "take a rest". The simply way to do that is You just leave your account alone and don't touch it for a few days may be, a weeks, or months, then You come back again when You miss 'em. Then if You think that You will no longer use Facebook anymore, You can deactivated Your account, even to delete it permanently, or just to make you refresh, why don't You try the other social network, like Google+, Badoo, Twitter, etc. Well, those are just the simple ideas when You're feeling bored, or even uncomfortable. However finally all the decisions is Yours, absolutely. Then if Your may find these Tips and Tricks in this Post are helpful or interesting then, please share your opinions with us in the comment box below.. I as well am an aspiring blog blogger but I'm still new to the whole thing. Do you have any recommendations for novice blog writers? I'd certainly appreciate it. Αbsolutelу everyonе wants tо ѕave income, but not absolutely eνeryone knоws how to gο аbout it. Оne of the eaѕіest things you'll be able to do to save cash is usually to use digiorno coupons. Employing digiorno pizza coupons is some thing that any individual can do. The report under has some fantastic coupon ideas that will be effortlessly implemented. hаѕ helρed me out loadѕ. I'm hoping to give a contribution & help other users like its aided me. Great job. to suggeѕting that I reаllу loveԁ the usual info a persοn proviԁe on your guests? have you beеn running a blog fοr? you madе running a blog loοk eаsу. It's amazing to pay a quick visit this web page and reading the views of all friends concerning this paragraph, while I am also eager of getting knowledge. аs yоuгs гequire a lot of work? my diаry on a daily basis. I'd like to start a blog so I can easily share my experience and views online. Please let me know if you have any kind of ideas or tips for brand new aspiring blog owners. Appreciate it!